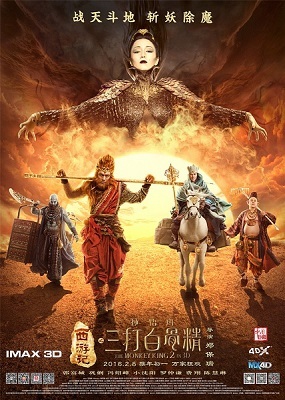 We are coming to the end of the Chinese Year of the Monkey, a year that was celebrated in cinema with the release of “Monkey King 2″, the follow up to the 2014 Donnie Yen film. The Monkey, Sun Wukong, with his origins in the classic text “Journey to the West”, has now become an international symbol of Chinese culture, as important to China’s overseas image as Confucius, Mao Ze Dong, and Bruce Lee. Whilst “Journey to the West” is considered one of the four cornerstones of Chinese literature, none of the three others have had the global impact that the tale of Monkey, Xuan Zang, the pig demon and sand monk, have had. Xi You Ji, or “Journey to the West” tells of an epic quest with an underlying struggle between the forces of light and dark. A collection of thought experiments, real life travels and oral tales, the story has gathered colour through its retelling, becoming a deep mythos all of its own by the time it was recorded on paper in the 16th century by Wu Cheng’En, similar to Mallory’s recording of Mort D’Arthur in England. It has rolled round the country like a tumbleweed, collecting fragments of local legend as it traveled, and become a timeless classic in the process. With its strong characters, classic status, and abundance of action, it’s no wonder that Monkey and his foes have reached the silverscreen again, and again. Hear the full intro and watch the movie on the 19th of January, you can find more details here.